Big Red: Congratulation on making it to states. We are all so proud of you. You are all winners. Best of luck. You got this! Band members: Thanks for playing your hearts out for our team. You make a difference with your talent and dedication. Keep on playing! Cheerleaders: Keep cheering our winning team on! Thanks for your school spirit and dedication. Always remember we support you and are so proud! You are the true champions no matter what the final score maybe! Those who cannot be there physically are with you in spirit and pride! PENN HILLS PRIDE! GO BIG RED! GOOD LUCK to the team, band and cheerleaders!!!!!!!! You all have made Penn Hills shine over the many weeks!!!!! THANK YOU for a 5th WPIAL championship go BIG RED!!!!!! We are so completely and totally proud of you all. We know you are going to do your absolute best to WIN! Good Luck Indians! You ALL have made the community so proud! Not only with your offense and defense, your cheers and your halftime shows, but with your display of exemplary conduct and good sportsmanship. I was so proud and honored to be a part of last weeks game in Chambersburg. Enjoy this once in a lifetime moment and Lets Go Big Red!! The bus drivers and staff at Krise Transportation would like to wish the penn hills football team, cheerleaders, and band good luck this friday in Hershey. Go Big Red!!! Good Luck to the PHHS Football Team! We will be cheering you on! Go Big Red!! Way to go! Penn Hills is so proud of all of you! Go get the win! Good Luck, Penn Hills Football! You have done far more than win games this year, you have brought a community together. You've reminded us why we are proud to be from Penn Hills and we are all rooting for you. Cherish each moment of this incredible journey and bring home that trophy!! LET’S GO RED!! Leave it all out on the field - the record books are waiting for you. Get ahead ... stay ahead! So proud of you! I'm so proud of our football team, but more importantly I'm happy to see you all represent our wonderful district. Be good sports and GO MAKE US PENN HILLS PROUD!!!! Best of luck!!! I look forward to watching the game! BRING HOME THE WIN!!!!!! AKIEM SNELL-Way to go Cousin! Show them how it’s done . DARIN,CAMERON,SAVANNA FRANKLIN. And a Big Shout out to all the Big Red Player’s. Forever Red and Gold!!! To all of my past students: I could not be a prouder "Mama Bair"!!!!! Congratulations! You have one more game to fulfill your dream of being a State Champion. Best of Luck. Go Big Red! Congratulations Band on a Great season! It has been a pleasure getting to watch you perform your Queen Halftime Show. I have also enjoyed being one of the proud band parents helping to chaperone. Good Luck to All of you both now and in the future. Go Big Red! You are the Champions no matter what. Best wishes and Toot Toot. Congratulations on making it to the state championship game! I'm so excited to go to Hersey to cheer you on! I'm so happy for you and proud of you! Thank you to the band and cheerleaders for keeping the crowd going and cheering the boys on! LET'S GO BIG RED! Let's Go Joey Gamza and the Big Red Marching Band and VE! We are proud of you! Play our boys on to a victory! Congratulations Big Red. Have a sweet time in Hershey. Play smart, play hard, have fun. You are already winners to me. So very proud of your accomplishments. GO RED! To the Big Red Football Team, It has been my honor working with you over the last few months. I have seen you work hard with your academics and play through adversity on the field. Each week, you have shown immense strides towards your goal. I am confident that your true sportsmanship will continue show on and off the field and make all of us Penn Hills PROUD! I am so proud to be the Penn Hills school board president representing such a GREAT group of people! Good luck, BIG RED!! Congratulations on an amazing season. You should be so proud - know we are! Good luck to all involved! Stay safe and remember how amazingly far you have come! So proud of everyone of you! I am so proud of you all! Good Luck....Bring home the Championship. Go Big Red!!!!!!!! Know where you are going and Know where you’ve been!!! As a 1995 graduate of PH, I wanted to send a shout out to the team for such a victorious year. This year's memories will stay with you for a lifetime. I actually graduated with several of the players' parents! As a freshman in college, I remember the exciting season that the 1995 team had that year. I came home from college to watch the WPIAL game at Three Rivers Stadium. I still remember the excitement in the stands from that win and then I traveled to watch them win the State Championship game a few weeks later. EACH of YOU are making an impact, not only for the players but for all of your classmates and alumni too! It was very exciting time and I doubt I have to explain this to you now because you are living it. I have always been proud to say I'm from Penn Hills. I wish each of you the very best on that field. Now, go out there and play your best! I'll be rooting for you to bring home the State Title!! Congratulations and Good Luck to everyone!! Good Luck Paige and Sarah!!!! March onto victory!! 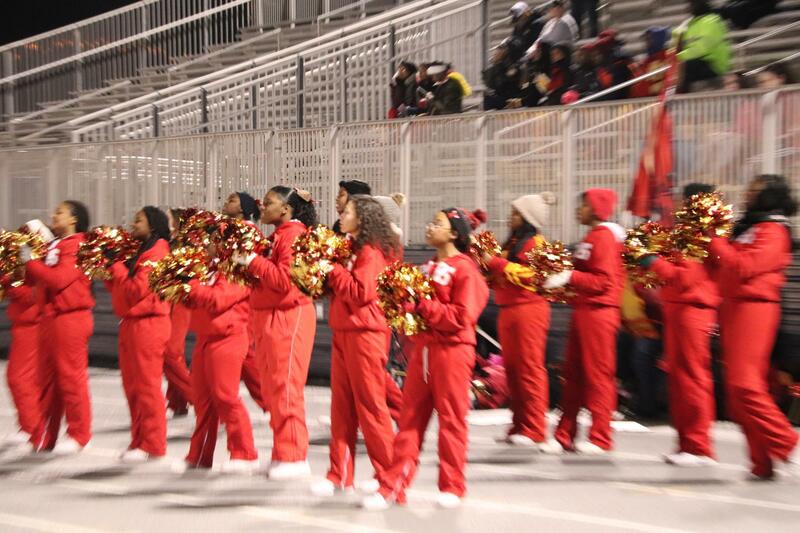 We would like to give a huge shout out to the Penn Hills Varsity Football team. Hard work pays off! Go Big Red!! Play hard and most of all have fun!! I could not be more proud of you! GO BIG RED! Congratulations and good luck in your final game of the season! We are beyond proud of your achievements! Your hard work and determination definitely has paid off. Good luck in Hershey! # PENN HILLS PROUD!!!! GO BIG RED!!!! We will be cheering you on! It has been my pleasure to cheer on our team, band and cheerleaders week after week even running concessions at 38 weeks pregnant. I do it all for you guys. Remember play your game, leave it all on the field and have fun. We will be there cheering you on. Love you all and we are the champions no matter what. Keep up the great work Dayonnia, Deijah and the rest of my band family and Most Importantly our awesome football team that got us this far. Shout out to Daequan Hardy and the Penn Hills Football team! Do your thing in Hershey tomorrow and bring it home! Dae Dae, I knew you would be great when you would use your shoe as a football when you were bored! Go Big Red!! We are all so proud of all of you! Congratulations and good luck Penn Hills Indians football team! Win or lose tomorrow night you are all already winners . You have the support of your community and this Penn Hills alumni family. We are so proud of all of you including the cheerleaders and the marching band. Especially my son Jacob Shepard senior tuba player in the band. Shout out to senior cheerleader Sarah. Enjoy your final game with the marching band Jake. We’re proud of your accomplishments & know you’ll do well tomorrow. Go Big RED!! My friend was in Hershey for a meeting. She let me know that the sportscasters were commenting on the Penn Hills team - speed and athletic ability. I’m enjoying hearing about your victories! They make all of us smile! 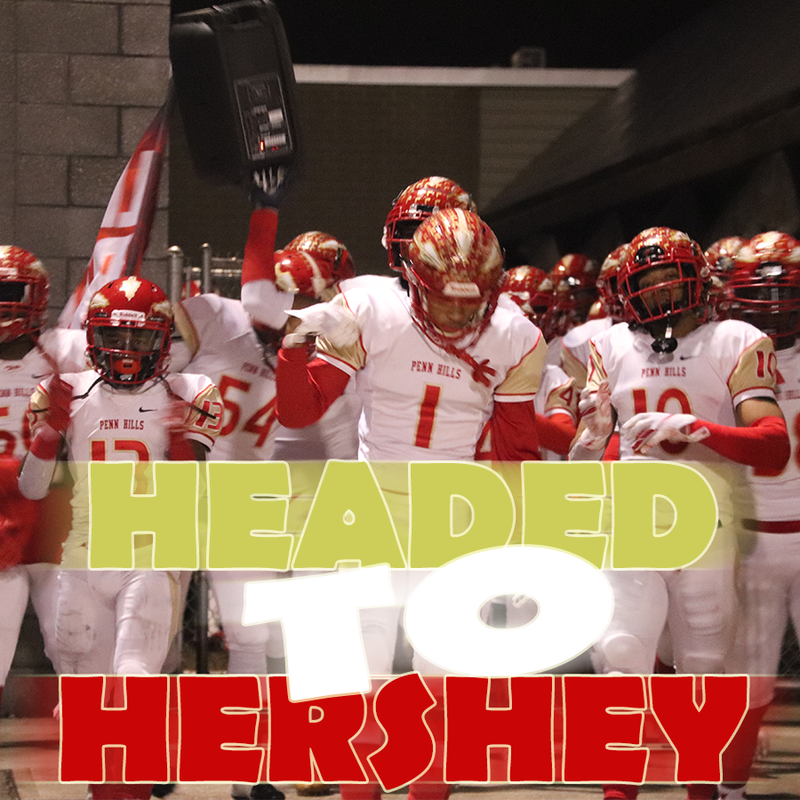 Know that ALL of Penn Hills is with you as you make your way to the “BIG HOUSE” in Hershey, PA! Win it, BIG RED, for your entire community! We are with you ALL OF THE WAY TO VICTORY! You all are such an inspiration, to not only our school, but our community. Cheerleaders, thanks for always being there for the boys when they need you most! 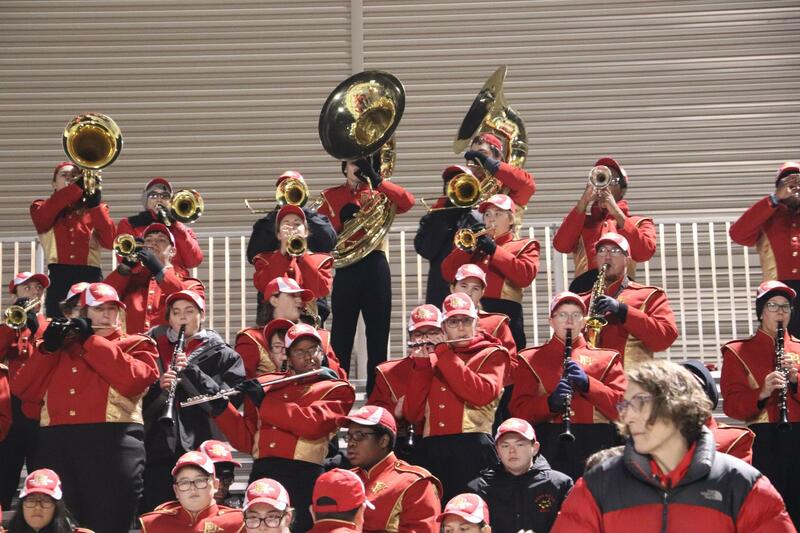 Big red band, you are the reason I go without sleep every Friday and I wouldn’t have it any other way. You guys have been giving those boys the fire and energy to push themselves past the brink! It has been a very exciting year to be a part of this wonderful organization! Keep pushing for better, keep striving for more, and let’s DO this!!! Let’s goooooo redddddd!!! Congratulations to the amazing Penn Hills Team. Good luck in tonight’s game!!!! Thank you to everyone for your support, encouragement, and enthusiasm!